Yes, I sewed for myself again! Yes, it's yet another Cowl-neck tunic! I have more than one ugly neck scar to hide. 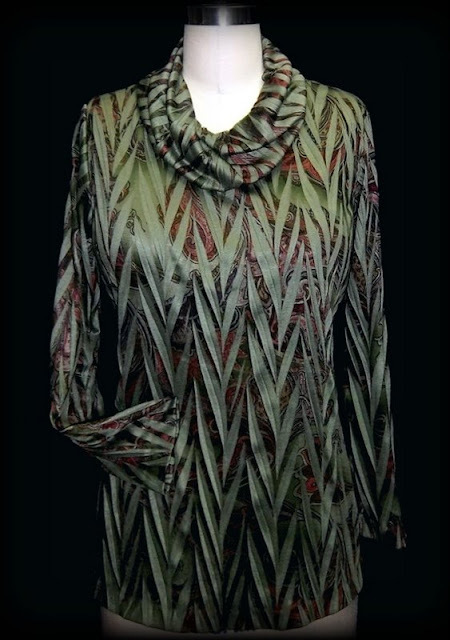 This version features a applied cowl collar that has been "spiraled" before being sewn to the neckline. I love how a Spiral Cowl always drapes in nice even folds and covers the neck seam...rather than just "flopping down". This tunic is the latest in the "OMG Pam is Sewing For Herself !" series of garments ;) It is an original hand-drafted design of mine, and features a classic cowl collar that has been diagonally ruched. 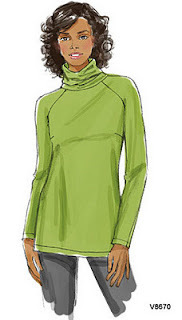 Even though I drafted the pattern for my tunic, it is very easy to do with any pattern that has an applied cowl collar, like this style from Vogue, #8670. From cutting out the pattern pieces to wearing my top out to dinner...took less than 1.5 hours! I enjoy "almost instant" sewing-gratification, don't you? (20" long) x (the circumference of the neck edge + seam allowance). Next the collar was turned WRONG sides together, hiding the seam allowances inside. Note--the seam is the CB of the cowl collar. 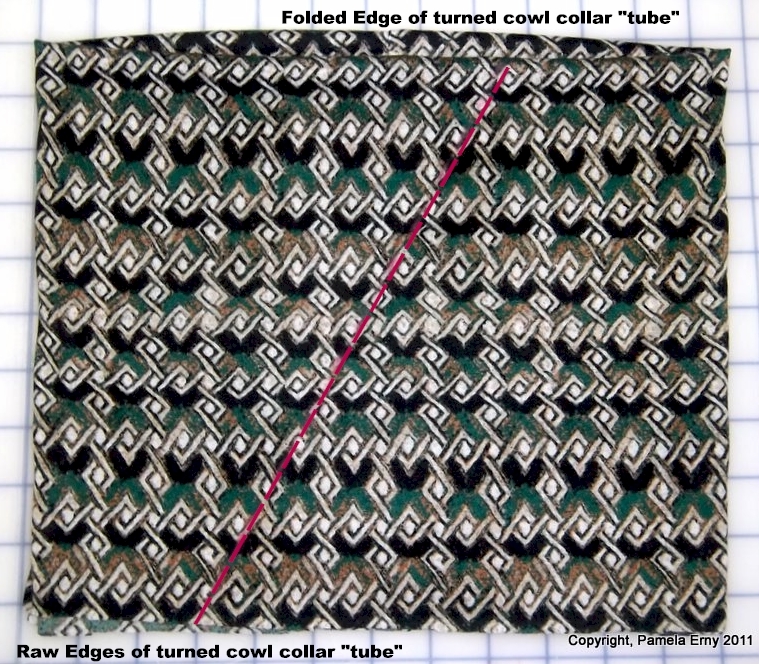 The "Angled Ruche" cowl collar was attached to the neck-edge by matching the quarter-mark points (right side of collar to right side of bodice), then aligning all the edges as they were stitched together. I will probably make another of this style soon, perhaps positioning the ruche to the side (near the shoulder seam point) of the neckline...or maybe running 2 lines of ruching vertically at Center Front...or 2 lines in a \ / shape...or.... Well, the possibilities are endless! NEW styles of interfacing have arrived at Fashion Sewing Supply ! PRO-TAILOR Classic Sew-in HAIR CLOTH/CANVAS 63"
PRO-WEFT Supreme MEDIUM-weight Fusible INTERFACING 66"
PRO-TAILOR Classic Fusible HAIR CLOTH/CANVAS 68"
Sewing for ME! ...and a simple Pattern "Up-Sizing" Method. The pattern I used for this top is my absolute favorite cowl pattern, Ottobre Design (Woman) issue 02/09, #5. However, I have "up-sized" since I last made one of these, so I needed to "up-size" the pattern. I didn't need to change much in the back, but I needed to add more room in the front. 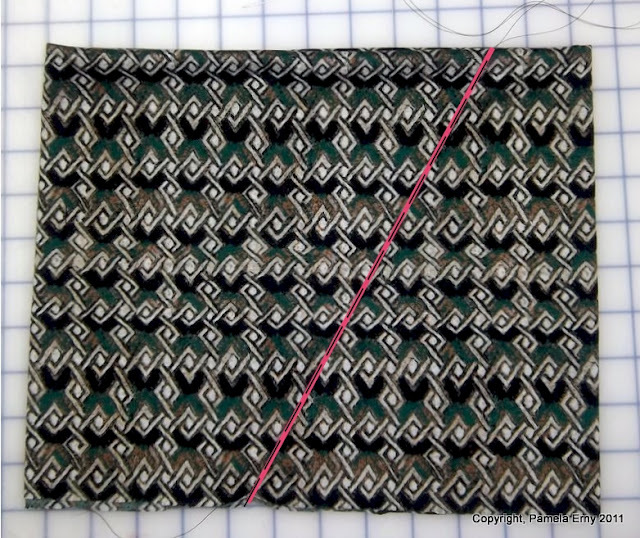 So, since this is a simple pattern for knit fabrics with a cut-on facing...my options for accomplishing this could be much less 'textbook' than if I was making changes to a pattern designed for woven fabrics. I just moved the Center Front about 1" away from the fold of the fabric, and cut straight across at the top edge, and at the hem edge. That's it! Now I had a front garment piece that gave me the 2" of extra room I needed for the "extra" that exists on my front at the moment ;) Adding that extra width also made the cowl a little deeper...a side-effect I happen to like. Doing a "quickie" pattern alteration like this worked for me because this is a simple knit silhouette. Standard pattern alteration methods are best when you need to Up-Size a more complicated style, especially when designed for woven fabrics. Do you remember when I told you that I was going to sew a new shirt for Roger? So starting today I am going to make time every day for the next 2-3 weeks to sew for MYSELF, for a change! Well...I might squeeze a couple of children's outfits for Julianna and Brooklyn into the mix...but most of the "sewing action" will be for me me me me me! I have just started to lose the 30 pounds (!!!) that piled onto my body over the past year....before and after surgeries while the docs were trying to get my thyroid hormones and other stuff balanced. My first thought was to wait to make new clothes until my figure was back to normal...but who knows how long that might take? So phooey on that! I want new clothes and I want them now! I'll post what I make here...including a few tips and techniques...so stay tuned. WTHeck is right...isn't it pitiful? Exciting NEW styles of Interfacing are on the way! I've developed some wonderful new Traditional Sew-in Hair Canvas (sometimes called Hymo) that is 50% hair and 50% wool...NO synthentics...and it's 63" wide. It is the type and quality that is sought after by the finest tailors in the world...but...we have had it steamed for you so it's ready to use right away! No pre-treatment is necessary...none-nada-zilch! It does Not shrink. At. All. We have the same quality 50/50 Hair Canvas (68" wide) that's been specially woven to accept the application of the wonderfully flexible fusible resin we've become known for. Again, this new Fusible Hair Canvas needs no pre-treating...the yardage has been thoroughly steamed...it does NOT shrink. Does it get better? Yes! 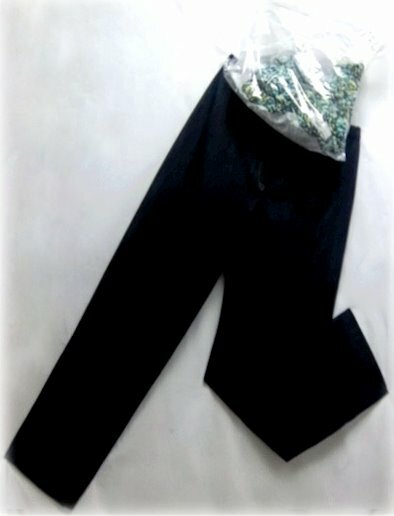 I am just waiting for the rolls to get here (5-6 days more days), before I can put them up for sale on www.FashionSewingSupply.com. Maybe I should have waited before telling you about them...but after developing and testing them for months, I am just so excited that they are almost here! 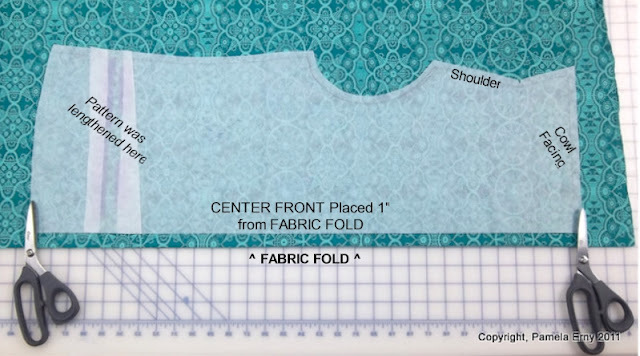 If you want to be notified when they arrive, just sign up for the Fashion Sewing Supply Newsletter (tan box on the the left of the blog page). OK... Now I have to go catch a bite to eat, catch my breath, and then get back to work...I am so glad I love my job!